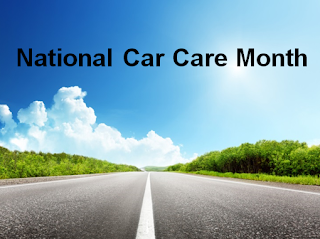 April is National Car Care Month! National Car Care Month reminds drivers to spring into action and perform vehicle maintenance and repairs to ensure their car's running at peak performance. During the spring, drivers should address any issues that have occurred or gone ignored during the winter, and take the necessary steps to get their vehicle ready for summer. Like with fall and winter, this time of year brings its own set of hazardous, such as wet, slick roads. It's critical to have your vehicle ready for the rain to avoid accidents and other issues. Get your car ready for the warm season with our car care tips at Autoland in Springfield. While some of these steps can be performed yourself, others require a skilled auto professional. To ensure your car's in tip-top shape, take it to our car dealerships in NJ for service and repairs. Winter driving will cover your car's undercarriage with road salt and other grime that can cause corrosion, and eventually rust problems. Use a high-pressure garden hose to loosen and remove winter grime. For a more thorough cleaning, use a jack to raise your car. Salt and dirt can also damage your car's paint, so you'll need to give it a good cleaning as well. Once you give your entire car a wash, apply a paste or liquid wax. Then, use a steam cleaner or rug cleaning spray to remove salt and grime from the interior. Inside the hood, wipe down the engine with a soft cloth and soapy water and remove any leaves and debris. Also clean the battery with a toothbrush, baking soda and water to remove residue buildup. You should have your tires rotated every 5,000 to 10,000 miles. It's a good idea to have your tires rotated as part of your spring maintenance routine. Also, check your tires for signs of wear and tear and inflate them to the proper level, which can be found in the owner's manual. Keep in mind that cold weather can cause under-inflation, while warm weather can cause over-inflation. Don’t forget to carry a spare tire and jack in the truck, and make sure they are in good condition. You probably didn't use your air conditioner much during the winter, but you'll certainly need it come summer. Make sure your system is operating properly; run it to confirm it's blowing cold air, and look out for any odd noises or odors. Have it inspected by a certified technician to assure it's running efficiently and won’t fail on a hot summer day. 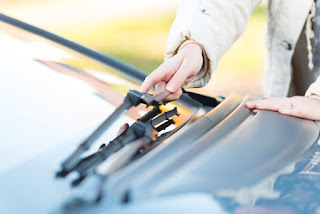 Wiper blades work hard during the winter. A wiper blade's life expectancy is between six months to a year, so they should be examined in the spring. If your windshield wipers are worn, leaving streaks, making strange noises, or failing to make full contact with the windshield, then it's time for a replacement. Also refill the windshield wiper reservoir if necessary. Your car can't run without a battery, and it gets a real workout during the winter. Cold temperatures require your battery to work harder to provide the same amount of heat and energy. This is the reason cars often stall after being left in the cold and snow for a few days. Test your battery, plugs and wires to ensure they are operating properly, and replace any parts that are old, worn or damaged. Your car's brake system is the most important safety feature and needs to be inspected in the spring. Winter can take a toll on your brake system, so examine the entire system, including the lines, hoses, brake pad, and parking brake, to ensure they're in pristine condition. Also fill the brake fluid to the proper level. Follow these spring car care tips to be certain your vehicle is ready to tackle the warmer weather. To have your vehicle serviced by our certified technicians, visit our dealership located on Route 22 in Springfield or call (877) 537-6035.